At a meeting on October 2, the board agreed to set up a working group to review and add to the resources available on the ISA website. While it is useful to offer resources, we also want to be sure that the resources we provide are appropriate. This working group will be in touch with a survey to collect information from members so that we can provide the resources you need. They will also start a review process of resources already published on the website to ensure they are appropriate. We will be in touch in a couple of weeks to find out more about you, our member organizations. Keep an eye out for any email from us soon! We’ll be asking about information to not only help us to update our pages about your organization, but also to update our records so we can understand how you function, your membership levels and how you run your organization. If we are unable to reach you through our existing contact information, we will try to reach out through other methods, but it would also help us if you could check your country’s information listed on out website. Just check our membership page to check if your details are correct. If not, contact us through our contact page and, if we will send you our email seeking some additional information. The first meetings of both World Congress organizing committees have met and, while still in the early stages, progress is positive, but there are many issues to be worked through. By sharing information between the two organizing committees we hope we can share the knowledge gained between groups to provide a better congress. The online conference is underway! Come and visit the site and see all the contributions by not only PWS, but also by SLP and others! There’s an interesting mix of content this year and many different interpretations on the theme. Don’t forget to stop by the Ask an Expert group, and let us know what you’re doing in your country in the ISAD Around the World section of the site. We also have the mental health group running the Connecting to Others section, which always has some thought-providing discussions. 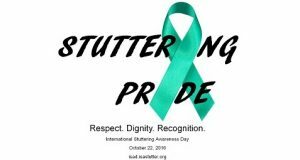 Every six months we publish the magazine of the International Stuttering Association, One Voice. We are now looking for articles from our members. Please, can you contribute an article about what you are doing in your association and send it to us at onevoice@isastutter.org. Not sure what to contribute? Take a look at previous contributions at our One Voice page. Do you have a suggestion for what we can do to help you? Please, get in touch via our contact page and let us know!